This species is accepted, and its native range is Assam to Peninsula Malaysia. India (Andaman Islands), Myanmar, Thailand (West and Peninsular). Also South-east Thailand (Hodel & Vatcharakorn 1998) and Peninsular Malaysia (Dransfield 1979). Occurs only marginally in Indochina; common and of no conservation concern in the Thai-Malay Peninsula. None recorded in Indochina. The cane is of good quality and there are trial plantations in Peninsular Thailand (R. Pattanavibool, pers. comm. 1999). Devi, S.P. & Singh, P.K. (2007). 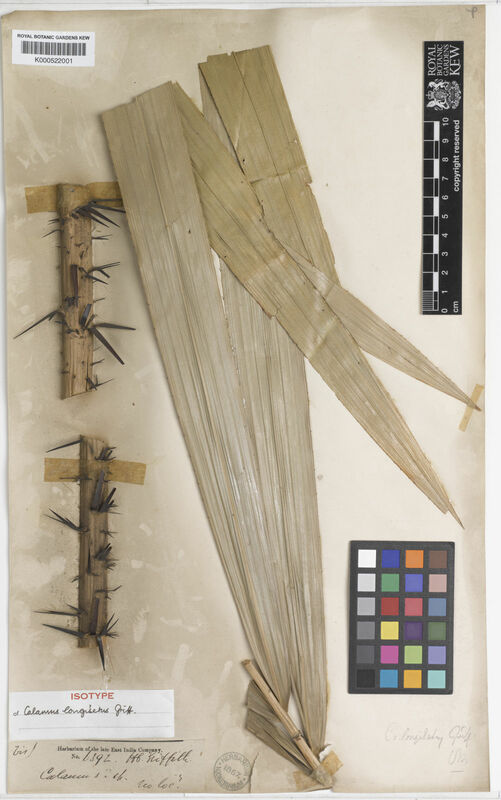 Rattan of Manipur: tree new records for the state Journal of Economic and Taxonomic Botany 31: 460-463.